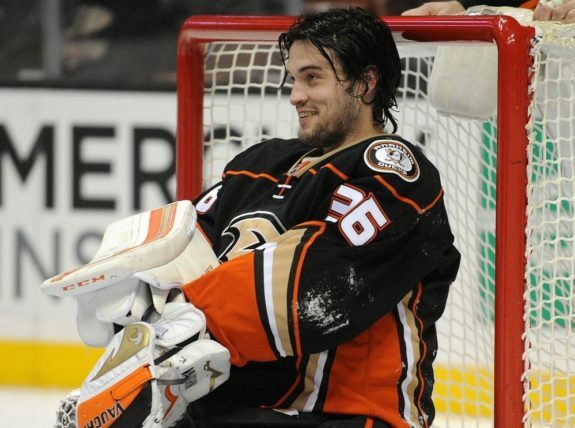 John Gibson is likely the best goaltender in the 2011 draft class, but he is by no means a sure thing. Gibson is still raw, and has only enjoyed a small amount of success in his years with the USHL. He will likely be selected in the 2nd round by a team that doesn’t need goaltending help in the foreseeable future, but may need a new number one in the next five years. Gibson has good size and plays a conservative style of goaltending to cut off angles and leave little net for shooters to look at. He plays a butterfly style with a veteran poise. He also possesses great strength, an attribute of his that all scouts rave about. He is not the most athletic goaltender in the world, hopefully something he can work on in his first year at the University of Michigan. Gibson has a long way to go until he reaches the NHL, but he may someday be a team’s number one goalie. John Gibson did not participate in the top prospects game. John Gibson has shined internationally at this young juncture of his career. This year he won the award for Best Goaltender at the Under 18 World Juniors. He also posted the best GAA of any goaltender in the U-17 WHC. A middle of the pack number one goaltender. Follow Patrick Kearns on Twitter @THWpkearns for prospect info and updates.